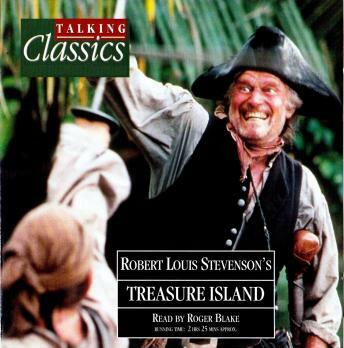 Stevenson's classic tale of 18th-century intrigue, conspiracy and piracy has everything an adventure story should have, especially a resourceful young hero in Jim Hawkins. From the moment a drunken sailor arrives to menace the tranquillity of his father's inn, Jim is caught up in a web of plots. By chance rather than design, he finds himself the central figure in an attempt to recover the buried treasure of a pirate named Flint. Long John Silver's villainy and the search for this booty spark off skulduggery, murder and betrayal. 1. An Unwelcome Guest - A drunken sailor - The 'black spot'. A rough-looking sailor, 'Captain' Billy Bones, arrives at the Admiral Benbow, an inn owned by Jim Hawkins' father. Billy asks Jim to watch out for a sailor with one leg, and when a pirate enters the inn looking for him, the two men quarrel. After Jim's father dies, a blind man, Pew, arrives and forces a piece of paper into Billy's hand. Billy dies of terror at the sight of the 'black spot' in his palm. Jim and his mother, determined to get the money owed to them for Billy's keep, search his sea-chest and find an oilskin packet. When they hear the blind man returning with his mates, they flee. 2. Flint's Treasure - Trelawney's decision. The pirates, led by Blind Pew, break in and ransack the inn looking for 'Flint's fist' - the oilskin packet. When they hear horsemen approach, they escape, but Pew is knocked down and killed by the horses of the pursuing revenue officers. These men take Jim to the house of Squire Trelawney, where Dr Livesey the local magistrate and physician is dining. Both men are fascinated by what they hear, and Trelawney relates the terror of Captain Flint and his riches. In the packet from Billy's chest they discover a logbook and map pinpointing treasure buried on an island. Trelawney decides to equip a ship to find this island and take the money. 3. The Hispaniola - Captain Smollett's fears - A conspiracy overheard. In Bristol, Jim finds a schooner, the Hispaniola, ready for their voyage. The Squire lacks discretion and shrewdness in choosing a crew, and the new Captain, Smollett, is unhappy that the men know too much about their destination. The ship sets sail and Jim is appointed cabin-boy. Chief among the crew is the one-legged cook Long John Silver. One night on deck, Jim overhears Silver telling the others how he sailed with Flint and realizes that he is now stirring up a mutiny. Suddenly, the lookout hails land. 4. Skeleton Island - Witness to murder - A shaggy castaway. Jim relates what he has heard to Dr Livesey and the Squire, and they arm themselves and their servants, before letting a number of the sailors go ashore ? 13 go, including Silver and Dr Livesey. Jim also slips ashore, but in secret. On the island, Jim sees Silver kill Tom Redruth, a sailor who opposes the pirate's villainous plans. Appalled, he scurries away but encounters a wild-looking man in goat skins. This is Ben Gunn, a sailor marooned on the island for three long years after suggesting a fruitless hunt for Flint's treasure. Ben is one of Flint's original crew and claims to be rich. Gunfire, however, ends their conversation. 5. Mutiny Starts - Futile parley - Jim's brilliant idea. Jim notices a stockade where Trelawney and Livesey are flying the Union Jack. He joins his friends and tells of Ben's story. They in turn relate how Silver and his pirates have mutinied and forced the Squire and the doctor to take refuge in the stockade. Soon after, Silver approaches offering a truce, but Smollett sees through his deviousness. Jim slips away unnoticed to find Ben's coracle and to attempt to cut loose the Hispaniola. As night falls, he paddles out to the anchored ship, now sporting the Jolly Roger, cuts its cable and climbs aboard. 6. Jim the Hero - Unhappy surprise. Jim finds that all the mutineers on board have killed each other in a quarrel so, single-handedly, he sails the schooner round the island, running her aground on shore. Then, crossing the woods, he enters the stockade full of pride at his brave deed. However, while he is away, Silver and the pirates seize the stockade, causing many casualties and injuring Captain Smollett. Dr Livesey is allowed to go free and sets off to consult Ben Gunn. When Jim returns to the blockhouse, he stumbles over a sleeping form and disturbs everyone. Jim is given the chance of joining Silver's band, but defiantly refuses. The buccaneers withdraw for a council and leave Silver and Jim alone. 7. A Cunning Pirate - A vote of no confidence - The doctor's warning. Silver tells Jim he has changed sides. Then, the pirates return and give Silver a 'black spot' for leading them to disaster. Unimpressed, Silver rejects their accusations and persuades them he is double-bluffing. He finally wins them back by producing Flint's treasure chart. Next day, Dr Livesey arrives to tend the wounded pirates. He warns Silver to beware of the treasure, but promises to try to save him from the gallows. 8. The Final Secret - Lost treasure - Silver vanishes. Next morning, the pirates and Jim set out to find the treasure, but are alarmed by a skeleton they see on the way. When they reach the place where the treasure is marked, they find an immense hole ? the treasure has gone. The pirates are about to attack Jim and Silver in their rage when shots ring out and two men are killed. The remaining three flee as Ben Gunn, Dr Livesey and a follower emerge. Ben explains how he dug up the treasure and took it to his cave. Over the next few days they carry the gold on board the Hispaniola and sail away, marooning the three remaining pirates. Silver receives his share of the loot and vanishes, but Treasure Island long haunts Jim's dreams.